Center for Soul Evolution is located in the town of Mt. Shasta, in northern California, at the base of the volcano. The mountain is well-known for its spiritual vortex, one of the greatest power spots on the planet. Energy-sensitive people from all over the world come here to visit or stay a while, to take in the transformational energies of this area. It seems everyone who has come to live here has their story about how they were drawn to the mountain, many times by strange things happening that brought them and kept them here, for as long as it is appropriate for their healing or for acquiring their next level of awareness. It seems to act as a magnet to many. We have heard of people spontaneously starting to channel or see Ascended Masters, taking initiations, and having all sorts of unusual spiritual experiences here. Also, in some people these transformational energies can bring up deeply buried anger and fear, so they have the opportunity to heal. 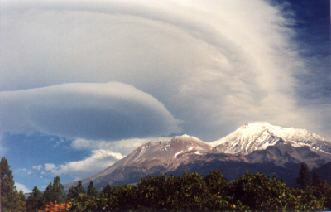 Antera and Omaran were drawn to the mountain for years, visiting more and more frequently until they were able to make the getaway in March 1999. To them, this is paradise -- stunningly beautiful scenery combined with veils so thin that Spirit is ever-present. They give thanks for their blessings daily! The closest large airports are Redding, CA, to the south, and Medford, OR, to the north. Both are about an hour and a half away. Amtrak stops in Dunsmuir, which is just 10 minutes south. Highway 5 goes right through town. Copyright © by Antera 2000, all rights reserved.